ALL HELL BREAKS LOOSE IN TEHRAN AS PROTESTORS UNLEASH THEIR WRATH AGAINST THE MULLAH REGIME……. – The Tundra Tabloids……. ALL HELL BREAKS LOOSE IN TEHRAN AS PROTESTORS UNLEASH THEIR WRATH AGAINST THE MULLAH REGIME……. NOTE: Somehow Ashura brings out the wildness of the Shiite, so maybe the following story should be viewed under that rubric. It’s that time of year again all over the world were the Shiite congregate, even in the good ol’ USA. 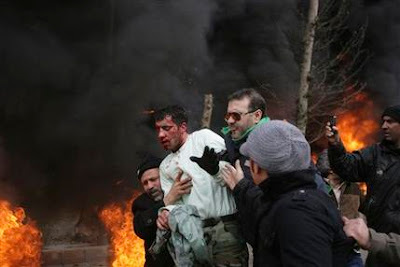 TEHRAN, Iran (AL-AP) — Iranian security forces fired on anti-government protesters in the capital Sunday, killing at least four people in the fiercest clashes in months, opposition Web sites and witnesses said. Amateur video footage purportedly from the center of Tehran showed an enraged crowd carrying away one of the casualties, chanting, “I’ll kill, I’ll kill the one who killed my brother.” In several locations in the center of the capital, demonstrators fought back furiously against security forces, hurling stones at them and setting their motorcycles, cars and vans ablaze, according to video footage and opposition Web sites. In Tehran, protesters tried to cut off roads with burning barricades that filled the sky with billowing black smoke. One police officer was photographed with blood streaming down his face after he was set upon by the crowd in a blazing street. Next Post Next Post QUOTE OF THE DAY AS HAMAS MARKS 1 YEAR ANNIVERSARY OF GAZA WAR…….